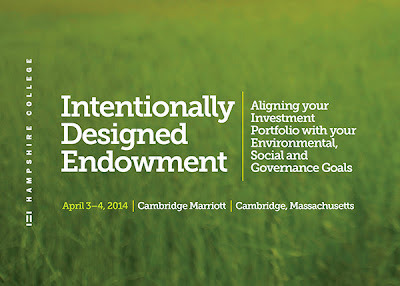 I am working with Second Nature and Hampshire College to host an event -- not quite a conference, but more of a participative stakeholder engagement gathering -- on the topic of endowment investment practices in April 2014. We will be hosting about 100-150 college and university presidents, business officers, trustees, endowment managers, private foundation officers, investment professionals, and other key stakeholders. While the movement encouraging endowments to divest from fossil fuel holdings is a strong driver of action in this space at the moment, this event will not be about divestment. 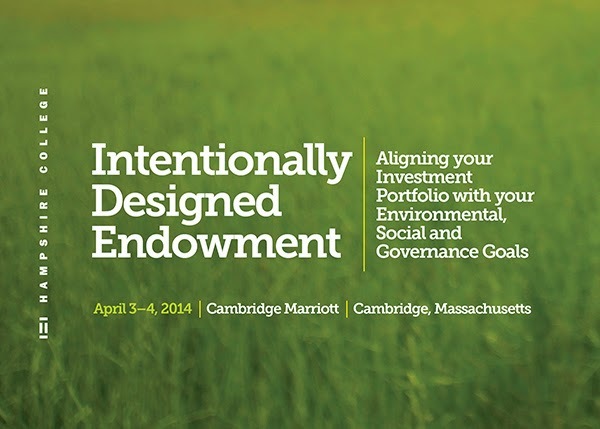 It will be a chance to learn about a range of investment strategies that can help institutions more closely align their investments with their values -- from positive or negative screening, to shareholder engagement or activism, integrating environmental, social and governance (ESG) factors, social finance, and more. We have engaged a great group of advisors to serve as a Steering Committee for the event, and will have Bob Litterman, a risk expert and former Goldman Sachs partner provide a keynote. We see this as an initial step in developing a broader initiative for fostering collaboration and action on effective, feasible and strategic approaches to responsible endowment investing.